SOCIAL COMMERCE is thriving in Thailand thanks to widespread and increasing use of social media across the country. According to the Electronics Transaction Development Agency (ETDA), Thais spend on average 3.5 hours per day on social media; the top three social media platforms are YouTube, Facebook, and Line. 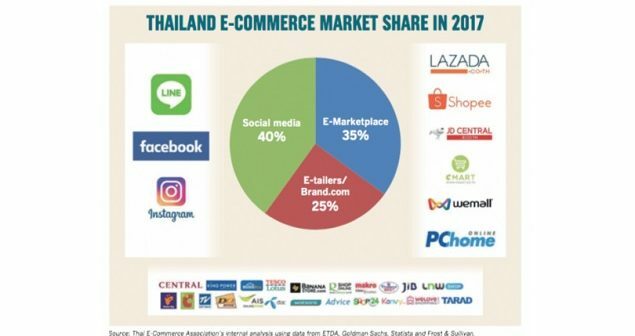 Thanawat Malabuppha, the president of Thai E-Commerce Association, said that social commerce is seeing rapid growth and playing an increasingly key role in business-to-consumer (B2C) and consumer-to-consumer (C2C) transactions. Around 40 per cent of the total B2C and C2C e-commerce transaction values in Thailand in 2017, amounting to about Bt150 billion, came from the social-commerce platform. E-marketplace accounted for 35 per cent and e-retail or branded websites 25 per cent. “Thailand and SEA [Southeast Asia] are high-growth markets for e-commerce. 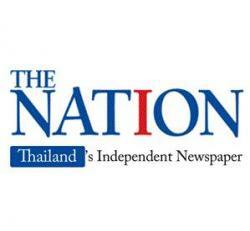 In 2017, there was 29 per cent growth,” said Thanawat. Meanwhile, data from PricewaterhouseCoopers (PwC) shows that 51 per cent of e-commerce in Thailand happens on social channels. He said that e-commerce in Thailand is continuously growing and it is expected that by 2020 about 84 per cent of Thai population or 59 million people will have access to the Internet. Thais are among the highest users of mobile Internet, averaging 4.3 hours per day. “The beauty of e-commerce is it helps SMEs [small and medium-sized enterprises]multiply their business by two times and their export revenue as well when compared with SMEs that are not tapping the e-commerce medium,” said Thanawat. John Wagner, managing director of Facebook Thailand, said that according to Facebook’s internal data, messaging is a key driving force in the rise of social commerce in Thailand. Thailand is the top country in the Asia Pacific, and one of the top five countries globally, where people messaged SMEs the most in 2017. As of April 2018, there were as many as 8 billion messages between people and businesses on Facebook Messenger apps, representing a four-fold growth year on year. As on May 2018, people shared more than 17 billion photos, and 400 million people use voice and video chat on Facebook. Meanwhile, as of April 2018, more than 150 million Instagrammers were connecting with businesses each month. And one in three of these conversations generally begins with an Instagram story. The growing popularity of messaging has created opportunities for businesses of all sizes. From using immersive visuals to establishing confidence and trust, messaging has the unique potential to draw people and businesses together into an ongoing conversation, ultimately enabling even more meaningful connections, Wagner said. He added that Facebook was serving as a discovery platform for Thais to find information, learn and connect. Thai consumers are at the forefront in terms of digital engagement, while Thai SMEs are leading the world in social commerce and innovation. Thai SMEs were among the first to develop social commerce businesses, which is helping to fuel Thai economic growth, and becoming a major trend for SMEs in other countries. “We are fully committed to investing to help businesses of all sizes achieve their goals and to contribute to Thailand’s transformation into a thriving digital economy, through social commerce and innovation,” said Wagner. Thai businesses are leveraging Facebook tools and resources for all their business needs and in doing so contributing to the country’s goal of becoming a thriving digital economy. “We are continuously offering new products to help Thai businesses,” says Wagner. “In August 2017, we launched in Thailand a card payment feature in Messenger, boosting social commerce and giving buyers and sellers a more convenient way to make transactions. “And this June, we expanded this into a bank transfer solution with KBank, giving businesses of all sizes an opportunity to close sales faster, and engage with consumers in a more secure and more efficient way. We will continue to educate businesses on how they can grow on our platform through workshops and education opportunities, and will continue developing products and tools that help them grow and create meaningful connections,” said Wagner. Another top social media platform in Thailand, Line, is also becoming popular as a social commerce platform. Line is the number one chat platform in Thailand; around 95 per cent of Thailand mobile Internet users are Line users. And [email protected] is a crucial tool for businesses and merchants to reach some 42 million people on the platform. In Thailand, there are around 2 million [email protected] and 240 Line Official Accounts. Ariya Banomyong, managing director of Line Thailand, said that Line is also the dominant platform in Thailand, with an average 63 minutes of 216 minutes spent on smartphones every day devoted to Line. Line has positioned itself as a smart portal, with Thailand offering users six groups of services – games, content, online-to-offline (Line Man), business solutions, payments, and other new services. At [email protected], merchants and businesses can utilise social commerce with several online features such as broadcast (text, photo, and video), poll, earning points, coupon, keyword reply, and segmented message that facilitate merchants to have more choice in doing social commerce including one-to-one, one-to-few, and one-to-many. Meanwhile, WeChat, a messaging service of the giant Chinese firm Tencent, is also playing a key role in driving social commerce. In Thailand, Tencent has WeChat Pay, and Tencent Social Ads (TSA) – an ads network service powered by Tencent cloud and big data. Tencent’s ads network covers many of its online platforms such as QQ, WeChat, QZone, QQ News, QQ Music, Tencent News, and Tencent VDO. Currently, WeChat has about 1.04 billion accounts; 90 per cent of them use WeChat every day; 85 per cent use WeChat Wallet; and 80 per cent of them follow WeChat Official account. WeChat Pay is the driving force behind the cashless society and social commerce in China. Patchara Samalapa, president of Kasikornbank or KBank says there are three key driving factors behind the rise of social commerce: increasing access to the Internet for Thais; easy and convenient online payment; and better logistics facilities. Pay with K Plus is a part of K Plus, the mobile banking of Kaskikorn Bank, which is connected with the bank’s business partner, currently Facebook Messenger. It is a free service for both shoppers and merchants. “K Plus is our mobile platform that aims to facilitate our customers according to their lifestyle and to let them select our service as priority payment and then leads them to use our other products and services in the future,” said Patchara. He said that Pay with K Plus will draw more online merchants to use KBank services since it helps them to reach out to 8.4 million K Plus users immediately and it is an easy-to-close sale. Merchants who receive Pay with K Plus have to apply as a Facebook Shop and set the payment as Pay with K Plus. KBank expects Pay with K Plus to see a 30 per cent increase in transaction numbers to social commerce since it is an easy payment method. In the next three to six months, KBank will expand Pay with K Plus to more social commerce and lifestyle commerce as well as online shopping. Suwatt Pathompakawan chief executive officer and co-founder of start-up Skootar, says even his company has benefited from the social commerce boom even though Skootar’s main service is to deliver documents. Social commerce is now around 20 per cent of total delivery transactions because of increase in deliveries. “More merchants are entering e-commerce on social media platforms, especially Facebook, Instagram and Line, as social commerce is easy to start and requires low investment, and they can reach many millions of potential customers using the social media platform,” he says.